Where did the time go? Well, some of it went to walking in the woods. Light and shadow and it’s still wintery enough for the light to be all golden. And… yes, clearly rubber boots were a good plan. There aren’t usually big puddles on this part of the main trail. Now the side trail. It’s not heavily used, so bits of it get a little overgrown. Golden retrievers don’t mind puddles. (And yes, this is the trail.) Which is fortunate, considering that the puddles extended on either side of the trail, so they weren’t really possible to avoid. This is not a puddle, but a surprise, hanging handily from a tree. What could a gardening implement be doing hanging by the side of a half-invisible singletrack mountain-bike trail through government lands? And yes, that is the trail. Actually, at the arrow, it was changing from deep pool to stream. And I will just mention that at their deepest, the puddles came to within scant inches of the tops of my boots, requiring a sort of cautious gliding motion rather than exuberant splashing. But water and mysterious trowels weren’t the only things we saw. There were some lovely funguses. There were even some relatively dry parts. And lots of dead leaves and moss. Altogether, it was a lovely walk. Or splash. Whatever. A couple of friends and I went up to Extension Ridge this week. They’d done it before in winter and said it was extremely beautiful; we figured it would be a good leisurely day hike. The trailhead wasn’t terribly prepossessing, I must say. Luckily I’d looked up the trail before we went, so the fact that a big chunk of forest next to it had been clearcut this year (it crosses private timber license land) was not a surprise. But as clearcuts always are, it was, well, pretty barren. I’m not sure why they left the arbutus trees standing. I guess they’re not considered salable? Their forms against the sky were quite beautiful, though. First point of interest: the Abyss. This is an earthquake fissure, though one source I found said that it was likely to be the result of a collapsed mine tunnel triggered by an earthquake. Either way, earthquake, and I’m glad I wasn’t there when it happened. The view looking away from the clearcut wasn’t half bad. More clearcuts, but higher now, so we got a view of the city and Gabriola and Protection Islands beyond and the Coast Mountains beyond that. The path, once we got away from the clearcut, wandered along the ridge through fir and arbutus trees—far more of the latter than I’m used to seeing. It really was beautiful, and completely worth getting through the shock of the clearcut. We wandered on for a bit and then had some snacks and carried on. Arbutuses really are quite indecently beautiful. Some of the shrine offerings are more respectful than others. Though I did like all the dragons. Getting closer to the end of the stretch of trail we were doing, we found a lovely lookout, complete with a metal bench. It was a memorial to Astraea, a much loved boxer dog. A great place to sit and nibble some more. I personally did not, alas, have dog treats, despite the hopeful looks. And another unprepossessing trail end. This is where we turned around and headed back. We figure it was about 10 kilometres return, so a nice walk for a September day. And one last arbutus skyscape, taken on the return trip. Well, not all of them are odd, but certainly there were some on a recent walk. This was the first one. Why had someone chiseled 3 holes into this tree trunk? It was done by humans, not animals; I know pileated woodpeckers peck rectangular holes, but they aren’t quite as rectangular and smooth-sided as this. And it looked like it was a few years old, and dug in rather than being a simple blaze. But here’s the other thing—the tree originally caught my eye because it was so obviously 2 trees nestled together; the trunks stood out because they were differently coloured. Except they weren’t. Higher up, they were clearly joined, and in fact the split doesn’t go through to the other side of the tree. This burned out stump wasn’t an oddity, particularly, but the hole was like an eye to the rest of the forest. And this isn’t an oddity at all, just some nice fungus. And a detail, because I can. One of the things I like about having a 700 acre park to explore is that you keep finding new trails even after some years of intensive exploration. Yesterday some of us found a new-to-us trail; I’m not sure how long it’s actually been there. I suspect it’s fairly recent or I’d have noticed it before. Anyway, Our Dog and I came back today to walk it in the other direction. Not all trails are very noticeable. (Yes, the arrow indicates the trail we found.) I tend to follow what look like deer trails off the main trails, just to see if they turn into something more substantive; I’ve found quite a few trails this way. Ah yes. The mountain bikers have been working on this one. I ride my bike on trails by preference, but not on those trails that require me to go up and down big piles of wood or over big rocks (or negotiate drop-offs—my bike’s suspension may be capable of it, but my personal suspension is past its best-by date). And I found a photographic treasure today; jelly fungus catching a wee bit of light. The dew on the needles had frozen overnight and was just starting to melt, so if I bumped into a tree I got showered in tiny ice pellets. This broken tree trunk was so interesting I took a black and white picture too. An altogether satisfactory morning walk. Setting out. A bit damp, but awfully pretty. “Where shall we go this foggy morning?” I thought. Well. Where better than a forest? This is the trail. Yes, this. Right in front of me. An awfully pretty trail. It’s considerably better than a deer trail, having been made by single-track mountain bikers, despite what the above photo looks like. There are not many places where it’s confusing about what is trail and what is not. It was also much brighter in there than these pictures show, but I didn’t want to flatten out the intensity of colours and contrasts by lightening them too much. I was thankful to reach the connection to trails I know well before it started getting dark, though. This, on the other hand, is not trail. Even though it looks like it should be. Sometimes the trails are a bit, erm, indistinct. And sometimes they’re a bit wet and creek-like. Don’t you want to follow this trail? The important thing about hiking on a new trail seems to be a good ability to spot green flagging tape. This has been our week for exploring new trails. A few days ago we hiked the new trail in Cox Park, and today I decided to take Our Dog out on the new trails in the Haven Woods, which just opened up to the public with the acquisition of a GALTT trail licence. We’d already been on trails there a week or so ago, and had explored quite a bit. But there’s a side trail marked on the map that would make a good loop, so I went looking for it. I didn’t find the end closest to King Road, but I found the other end. See the tape? Yes, it’s about that easy to see in real life. It’s very pretty. In this part it’s actually fairly easy to see the trail itself as the trail had been cleared a bit. Eventually the trail decanted me into a clearing with some lovely big old maples. After that came fifteen minutes of looking for the next piece of flagging tape; I did find it eventually, but the route had degraded into an overgrown deer trail and it was clear that major bushwhacking would have to happen. I considered doing it, but within 50 feet fell flat on my face in dense salal because I couldn’t see where I was putting my feet. 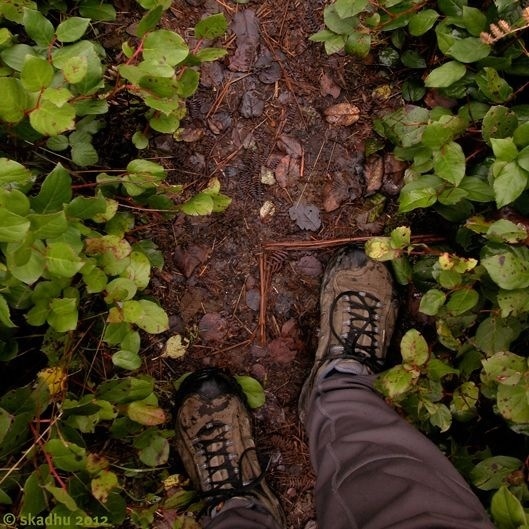 (Luckily dense salal makes a nice bouncy floor to land on.) So at that point I decided discretion was the better part of valour and retraced my steps. I understand there’s a GALTT workparty to clear the rest of this trail this coming weekend. I’m looking forward to exploring the whole thing once it’s a little easier to navigate. It’s a lovely walk. Some of our trails are rather narrow. This is one of my favorites.